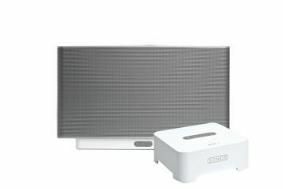 CES 2011: Sonos plans new form factors for multiroom music | What Hi-Fi? Freah from a bumper Christmas sales period, Sonos has entered 2011 with plans for additional hardware - and a bullish approach to Apple's AirPlay multiroom music rival. We caught up with Sonos founder and CEO, John MacFarlane at CES, where he revealed the company was planning "more form factors for playing music, more easily". He said there would also continue to be more agreements with online music services, such as its recent move to allow Spotify's streaming services to be accessed by Sonos users - a move that has seen Sonos sales soar in Spotiy's key countries, including Scandanavia. "Our mission remains the same," says MacFarlane, "to fill the house with music, and play everything ever made". He said there will also be more platforms for Sonos' controller software - already available for both the Apple iPhone and iPad - the latter app being downloaded 'at a record pace'. And on the subject of Apple, are Sonos concerned about the arrival of Apple AirPlay products, which enable users to essentially create multiroom systems from a range of compatible kit? "We consider AirPlay more of a positive than a threat," claims MacFarlane, explaining that the Apple solution cannot handle multiple or party zones like the Sonos system can, plus relies on wi-fi networks, rather than creating a dedicated network in the way Sonos does. "It would be hard for us to embrace AirPlay, because it would be a step back in functionality", he continues. However, he said there's potential for Sonos to support Android-based solutions as/when suitable systems emerge. Sonos would not reveal any technical or pricing information on its 2011 hardware updates, but rest assured we'll bring you all the info as we get it.